Let's get this out of the way now. Faith doesn't look like your stereotypical size zero superhero, she looks like an actual human being.She's a normal person with dreams and desires who happens to have extraordinary powers. 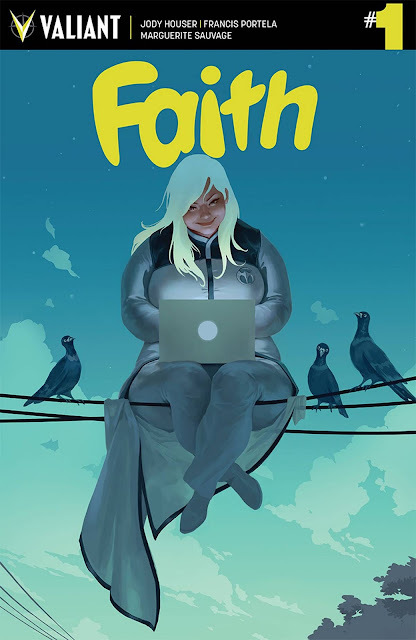 It's just one of the refreshing things about Valiant's latest miniseries and with 'Faith' #1, Jody Houser and Francis Portela have launched an exciting and endearing new hero worthy of an on-going title. Having never followed her time with Unity, I was able to see Faith Herbert aka Zephyr with fresh eyes. Houser took the difficult task of establishing Faith as a transplant to Los Angeles while referencing her past with great balance and narrative execution. Like Faith, we're looking ahead and not dwelling on the past. A new city to explore, a new set of friends, a new life flying solo, figuratively and literally. Faith's positive outlook and heroism is empowering. This is a great jumping on point to enter the Valiant universe with such a charming character. Faith even has a secret identity as Summer Smith, listicle writer for a very Buzzfeed-like website, and thankfully surrounded by a diverse cast of characters in all shades and types. You know, like in real life. Houser captures Los Angeles in funny and idiosyncratic ways, from the traffic on the 405 to finding a cool comic book shop in Burbank. Most of all we get to know Faith's world and it's inviting and beautifully rendered. The combined talents of Francis Portela, Marguerite Sauvage, and Andrew Dalhouse produce a bright and fast-paced story. There's a fun energy with the varied layouts and bigger panels of action that pop with bold colors. Faith is center stage as fierce and brave as any in comics. Faith has arrived. Representation matters in comics and Valiant delivered a special hero in 'Faith.' She is charming, brave, upbeat, and confident. Everything you could want in a hero regardless of appearance. The debut isn't without some issues but overall it shines brightly and with a cliffhanger to come back for. 'Faith' is a winner.